Filed to: Amachu!Filed to: Amachu! Today is ShadowHaken´s Birthday Yay! It will come on Summer 2016. 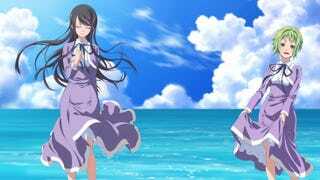 It has been revealed that the Amanchu! Manga will get an Anime adaptation on this Summer 2016. Junichi Sato will be the Director and the Studio is going to be J.C. Staff. Hikari Kohinata is a cheerful 15 year-old girl who lives near the ocean and she spends much of her time diving as a result. On her first day of high school, she meets a teacher who also likes scuba diving. There’s also a 16 year-old classmate, Futaba, who gets dragged along in Hikari’s maelstrom as soon as they meet at school. Most of the manga so far details the relationship between the two girls, which quickly seems to move into romantic two girl friendship-territory.